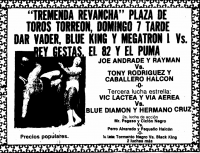 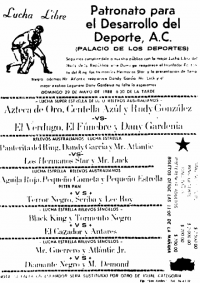 5) Black Man, Stuka, Tinieblas b Black Charly, Gran Markus, Gran Markus Jr.
1) El Duende & Hormiga Atómica vs Asterot & Misterio Jr.
5) Aladino, Centella Azul, Huracán Ramírez Jr. vs Black Charly, Chicano Montaña, Gran Markus Jr. 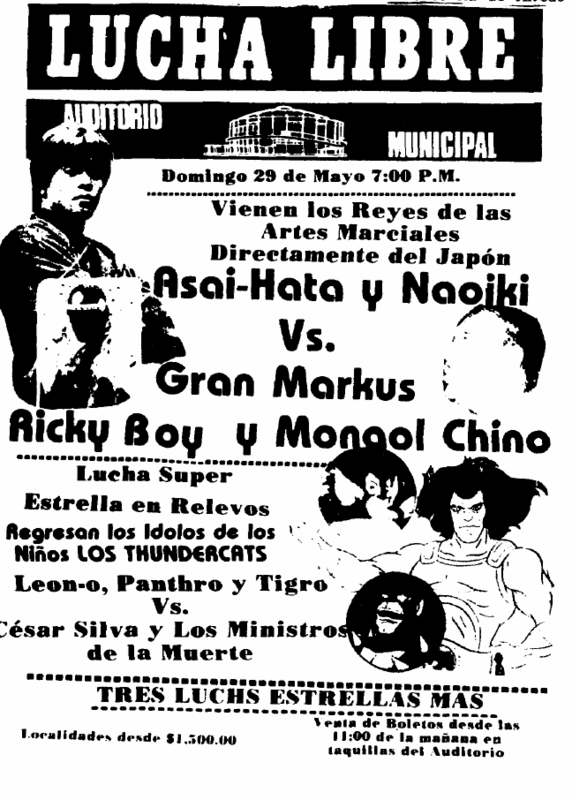 Event Notes: billed as continuning the Friday night shows; haven't seen them mentioned before! 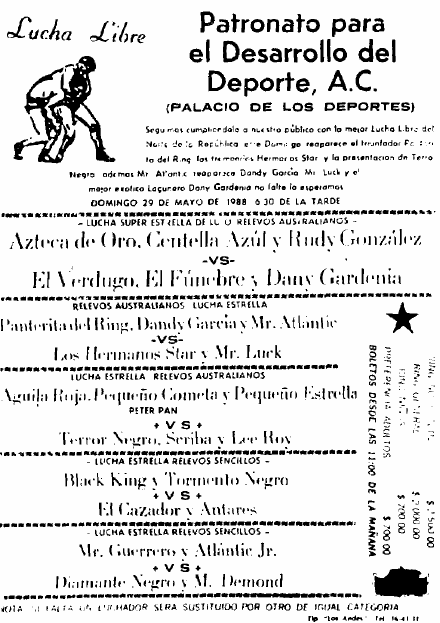 Azteca & Atlantis are champions. 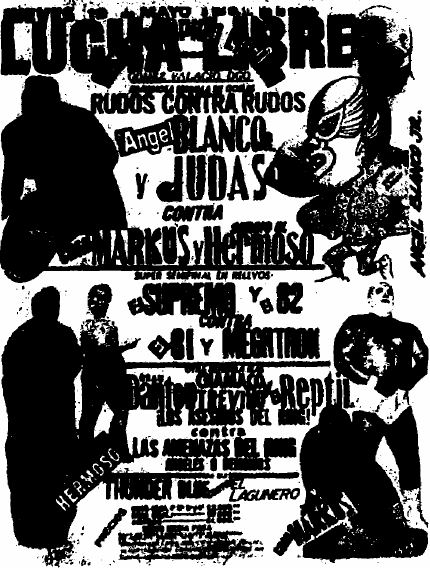 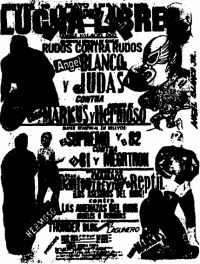 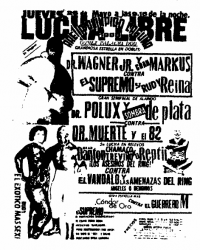 5) Lizmark, Stuka, Valente Fernandez b Espanto Jr., Gran Markus, Gran Markus Jr.
Rayo just happened to be one of the first out when he had a booking in Arena Mexico that night. 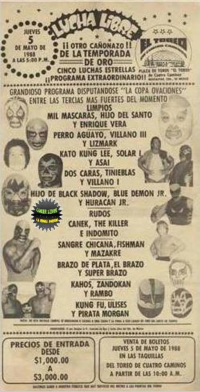 Navarro pulled Tiniebls's mask. 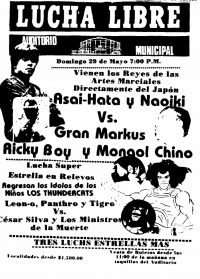 Battle royal determined teams the four last tag matches, with a prize to the winner of the last four surviving. 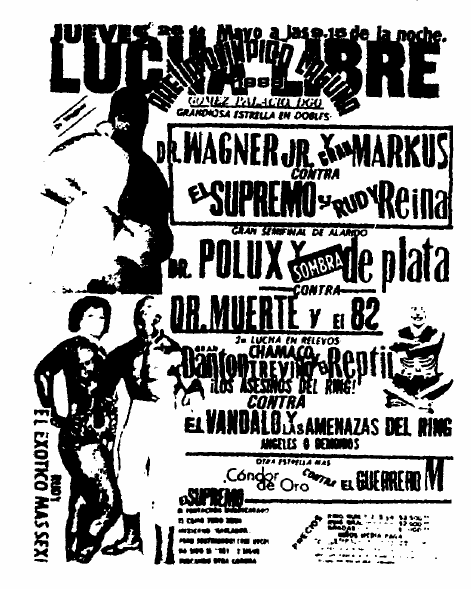 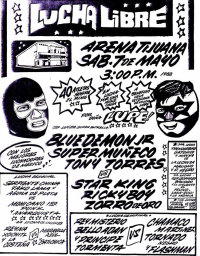 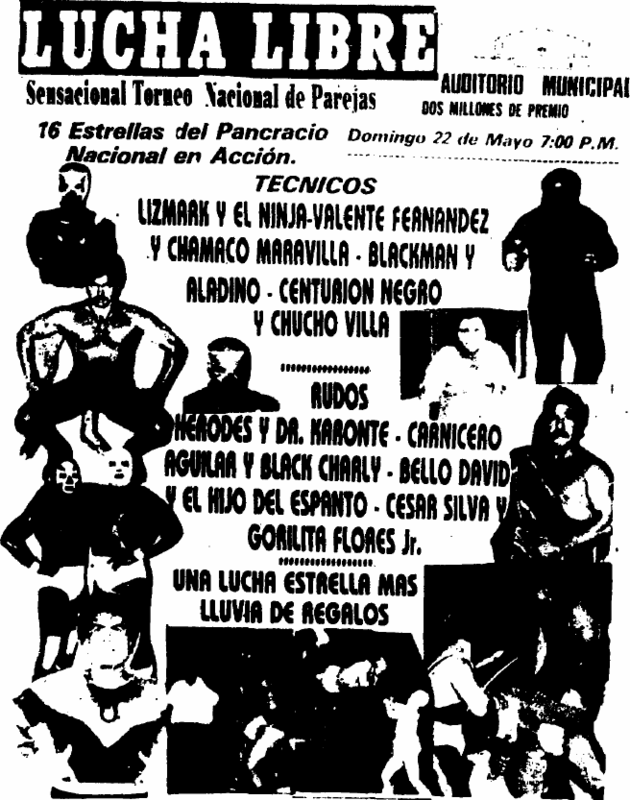 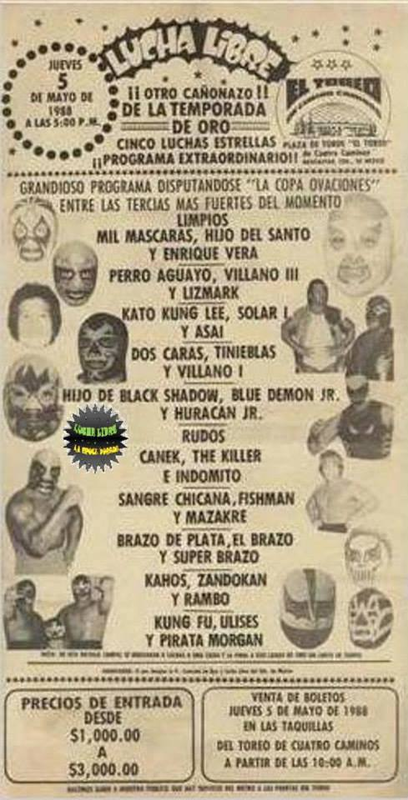 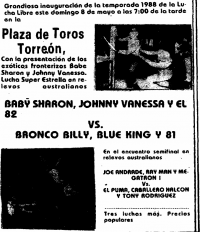 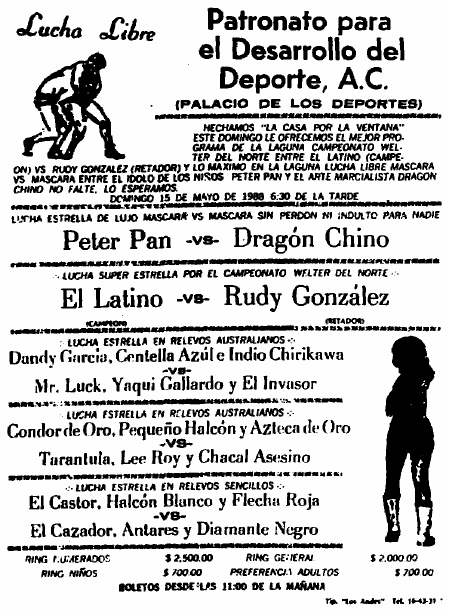 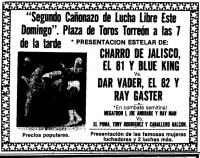 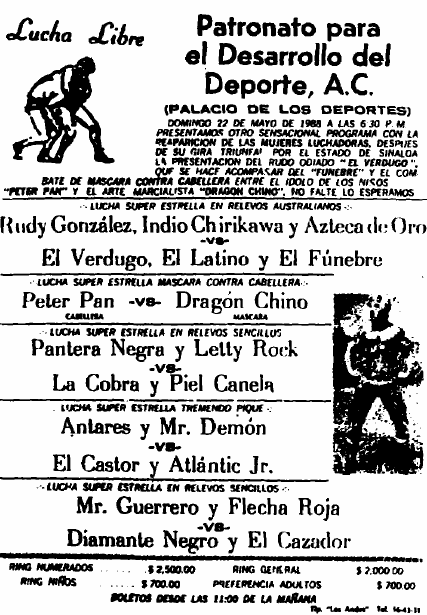 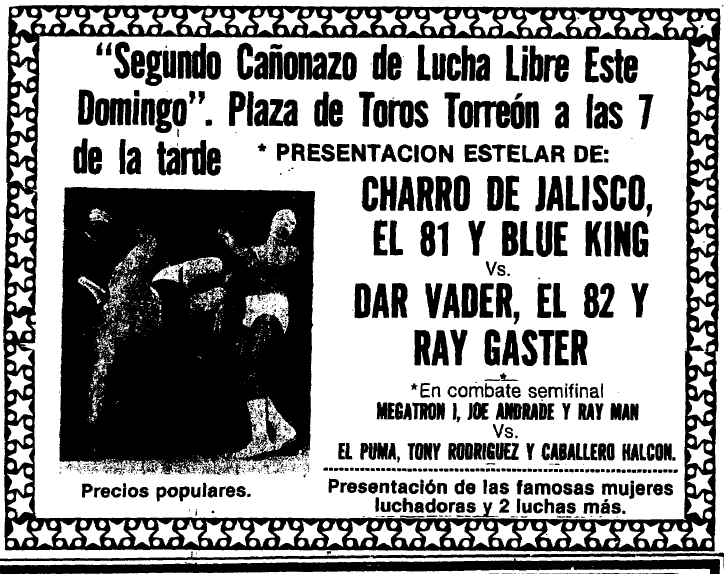 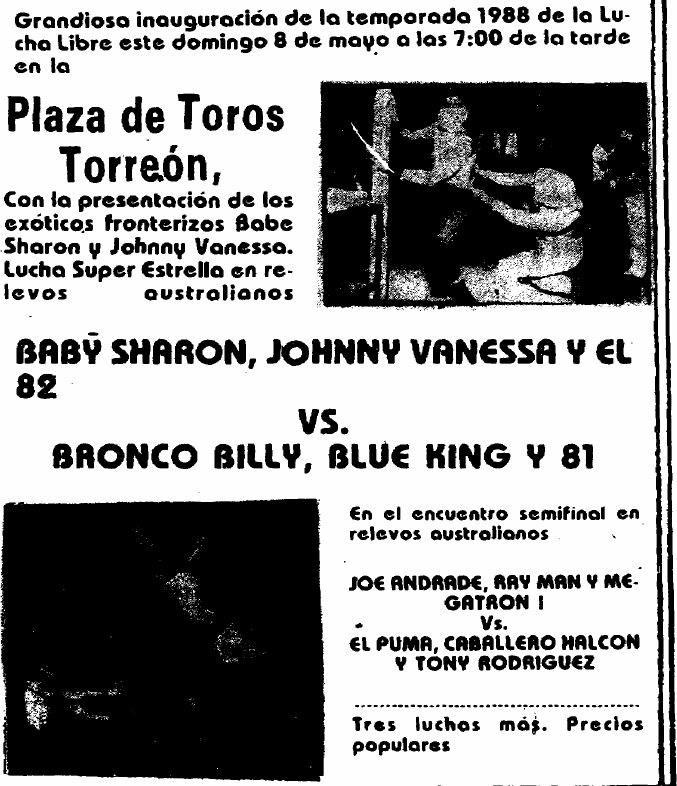 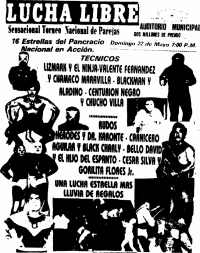 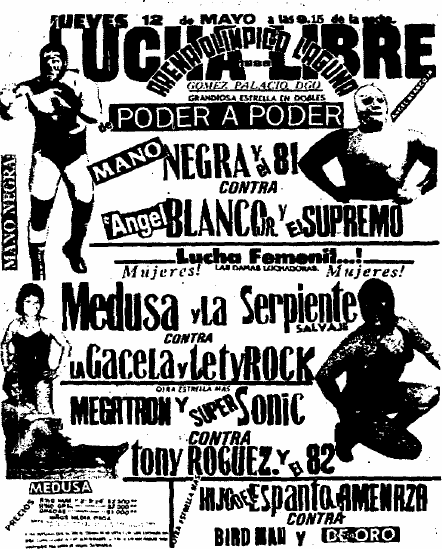 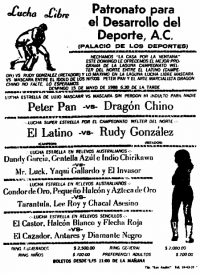 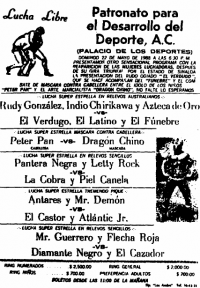 5) Fabuloso Blondy, Killer, Satánico b La Fiera, MS-1, Rayo de Jalisco Jr.
1) Kahoz, Pierroth Jr., Zandokan I vs ? 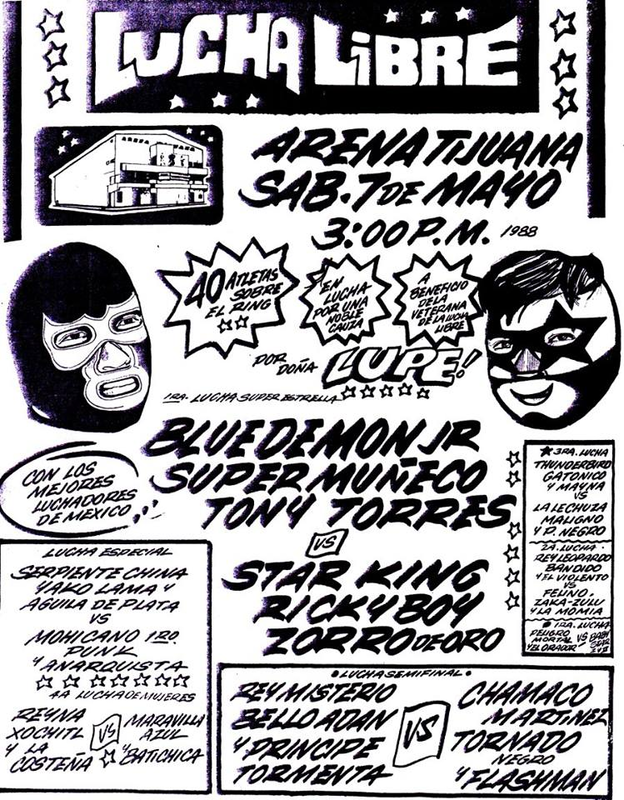 3) Américo Rocca, Anibal, Ultraman b Babe Face, Hijo Del Gladiator, Scorpió Jr.
Dandy Garica and Mr. Luck are headed to a mask vs hair match. As Charro won the title back. 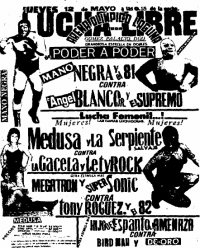 Navarro & Greo replaced Rocky Star & Sergio el Hermoso. 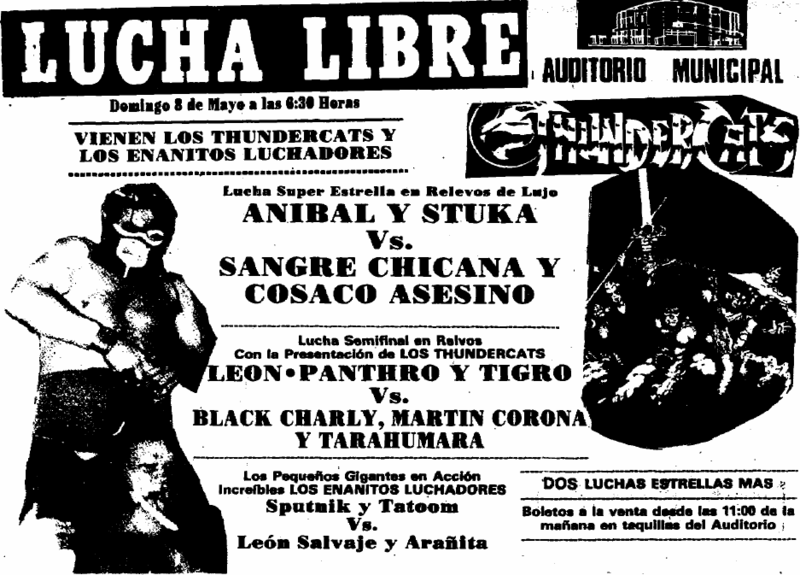 Fantasma & Panther fought. 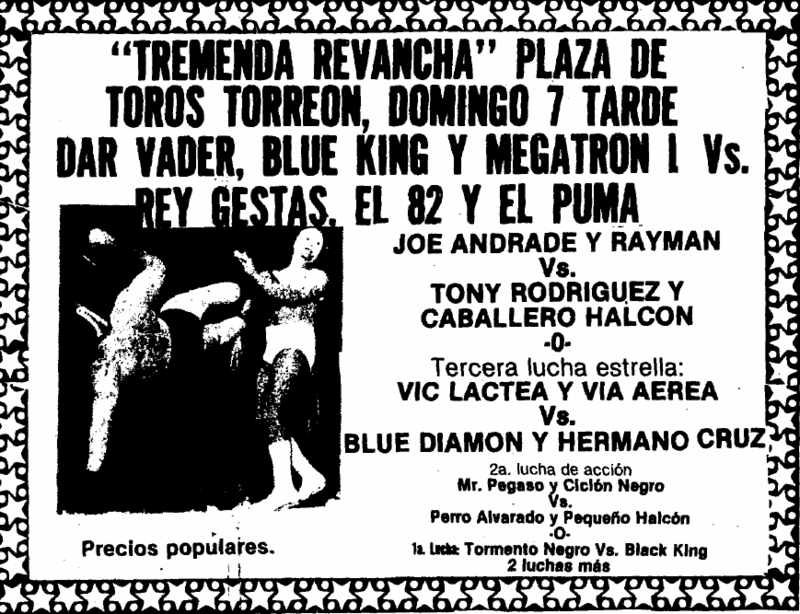 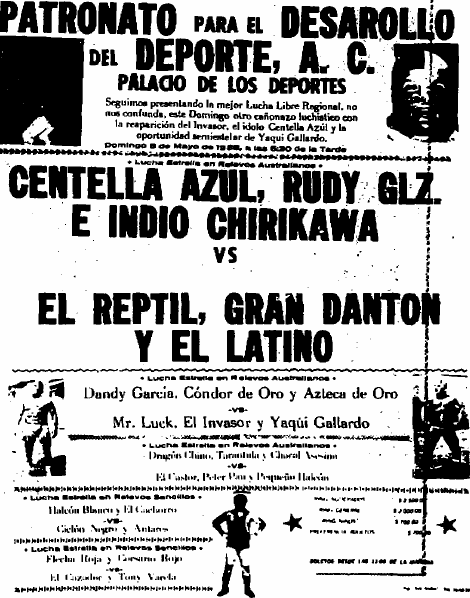 all women debuting as trainees of Blue Panther. 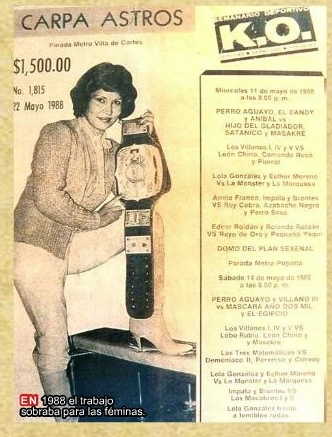 Neftali would go onto a long career, while the others would fade away.